The moment JK police had its prized catch in the fall of 2010, a swiftly-typed detention order read: “You are a known incorrigible secessionist and have been figuring adversary in police records since 1989…” It was the detention order for the street resistance’s ‘poster boy’ – who ‘fuelled’ uprising through his frequent protest calendars. That man is finally out of prison – not before spending 4 and a half year in detention. It is a festive mood at one fringe of Srinagar’s Zaindar Mohalla. A maze of lanes, by-lanes and alleys pass through typical structures of old city and open into the house amidst jubilation. A room facing the main entrance of the house is crowded. Inside: bearded men, scribes, well-wishers have surrounded a man – who has managed to stir up a storm in Indian Parliament with his release. He is Masarat Alam Bhat – the man who is greeting every person pouring inside with a smile, handshake and a hug. At entrance, Alam’s uncle is serving kehwa and bread to the visitors. Men split in small groups are engaged in talks, giving an impression, as if they have turned up for some grand celebration. The room is full of cheerful faces. The answer creates a pin-drop silence in the room. Everyone is looking at Alam. “Look,” he breaks silence, as grave looks flashes on his face, “we understand that hartal creates problems for people, but no cause is a free cause. It demand some sacrifice.” Everyone in the room is shaking head in approval. When such thoughts started making a Class 10th student restless, a friend took him to Batamaloo and arranged his meeting with his first political mentor – Mushtaq Ul Islam. It was 1987 when Alam joined Islam’s Muslim League. And soon he was seen participating in protests and demonstrations. By 1990, he was arrested at Batamaloo for the first time and faced 13 months of jail term. And thus began his journey as a jailbird. He was rearrested in 1993 and released in 1997. He was again detained in 1999, 2001, 2003 and so on. From 1990 to 2005, Alam faced nine detention orders and was incarcerated in various jails across the state. Meanwhile the buzz is building up inside the room. Alam continues to be the centre of attention besides attraction. In between, another interview begins. Most of his replies are short and succinct – giving an impression: Alam is a soft-spoken person. “The pro-freedom leadership is often blamed for shielding their sons from the cause they uphold, but exhorts others to follow it. How far it is true?” asks a scribe. Alam is right at least in his own case. His affluent family doing garment business faced a big slump after he decided to resist Indian rule in Kashmir. Over the years, the family has lost everything and are now living a modest life. In 2008, Alam shot to the prominence for his “role” in anti-establishment agitation in valley triggered by Amarnath land row. His rising popularity as a new political clout didn’t hesitate the authorities to detain him for 21 months on the grounds: “You are self-styled chairman of a secessionist outfit namely Muslim League, which believes and advocates the succession of state of J&K from union of India…” His arrest came one year after he married a woman who had lost her brother during the turmoil. By then, Syed Ali Geelani – whom Alam calls his “Qaid” – had found his man. 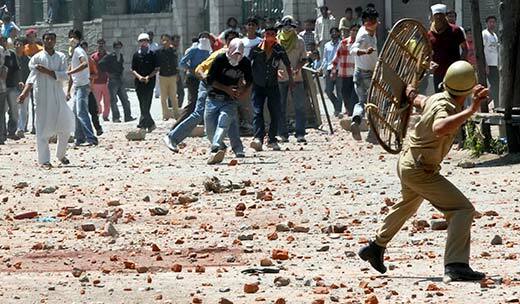 Alam’s role during the Amarnath land row had ‘skyrocketed’ Geelani’s confidence on him. But perhaps, both were unaware about the course of events to be unfolded in valley once Alam would step out of prison on June 8, 2010. Just three days after his release in 2010, shockwaves spread across valley when a teenager Tufail Mattoo was killed. Shutdown, protests and clampdown followed. 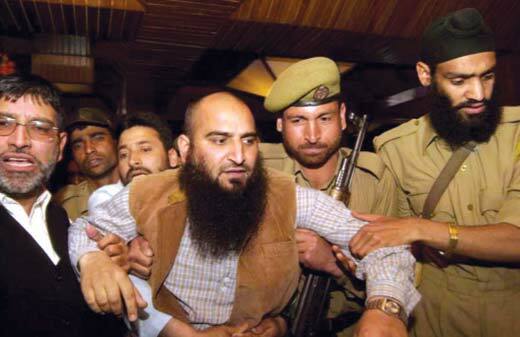 Within a week or so, Geelani along with Mohammad Ashraf Sehrai were behind the bars. It is said Geelani, before his arrest, dialled and directed Alam to take the charge of Hurriyat Conference and the movement along with Haji Ghulam Nabi Sumji. Alam immediately went underground, from where he rose to become the poster boy of street protests in Kashmir. From underground, Alam kept issuing protest calendars exhorting people “to continue resist Indian oppression”. Omar Abdullah (who had by then dropped his chips) was caught in twin-paradox: Alam’s rising popularity and his state’s forces’ ‘insufficient’ surveillance methods. To give a breakthrough to trace Alam though, a bounty of Rs 10 lakh was announced. And with that, Alam became the valley’s “most wanted” pro-freedom leader. The din inside the room refuses to die down akin to one triggered by Alam’s release in Indian Parliament. Amid this loud talking, a growing whisper is: “As if Mufti released someone who is about to wage war against the whole India!” In fact, the previous government did book him for waging war against the state. 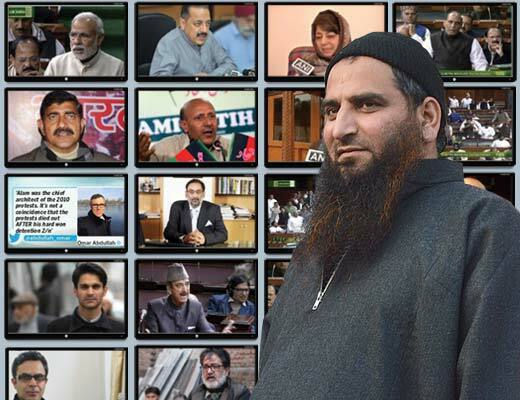 “Many are calling your release as Mufti’s masterstroke for projecting himself as a pro-Pakistan chief minister. How far do you agree with this?” another question by another scribe. Alam again responds the question with his signature smile. “I was released through a normal legal procedure,” he continues. “Ten in 2008 and six PSAs since 2010 were invoked against me on non-judicial grounds. It was a clear case of illegal detention. And since my PSA was about to end within a few days, therefore I obtained bail orders from the court. That’s it.” Alam has been detained under PSA – “lawless law” – 26 times since 1990; and has been bailed out in all the cases registered against him till date. 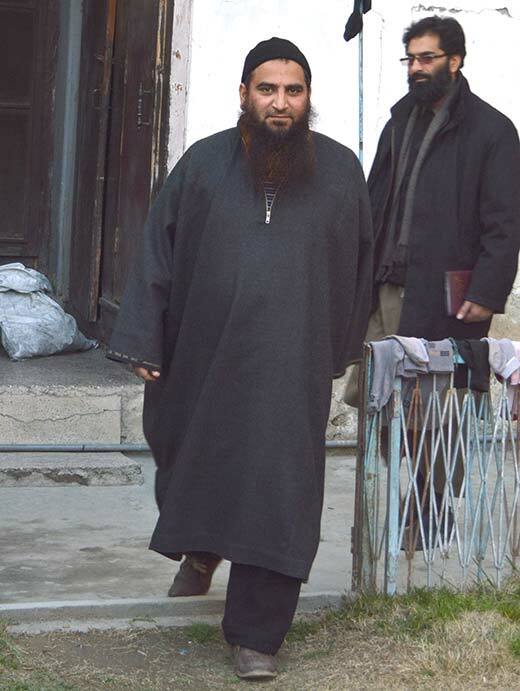 However, his 53-month long jail term finally ended in early March 2015 when a police party from Srinagar reached district sub jail Baramulla with his release order. He shortly had an emotional reunion with his uncle, his mother, his disabled sister and his wife, Zahida. Of his seven long year marriage, he spent six in prison. “Now, many pitch you as a successor to the aging Syed Ali Geelani…” “Look,” Alam snubs, “I am part of Hurriyat (G). We all abide the decision of the amalgam. No individual can take decision on his own.” His answers spread a wave of delight on the faces of men present inside the room. From 2010 onwards, DC Srinagar kept receiving the detention applications from SSP Srinagar against Alam’s detention thus: “…from acting in any manner prejudicial to the maintenance of security of the state, it is necessary to detain him under the PSA.” All the six PSAs slapped on him post-2010 maintain the same content and language. And from Mehraj Ahmad Kakroo to Farooq Shah, all DC’s kept signing the same document of his detention. But an orphan since childhood, Alam (nurtured by his granny after his father’s death and mother’s remarriage) would begin his day in prison by offering prayers. And then recite Quran, taking morning walk, breakfast, reading books, playing games and taking rest. Besides reading books on Islam, he also wrote a booklet called ‘Paigam’ and consequently faced an FIR in Kathua jail. The contents of his booklet, the cops believe, are “inflammatory and instigating”. Now, when prison gates have been finally opened for him, it seems nothing much has changed around. Akin to his pre-arrest anti-India uproar in Kashmir, the post-release uproar in Indian Parliament has already made Modi to pitch his su’er (tune) with House’s aakroush (rage). It seems the man who is already known for his “shock value” image has now become a synonym of “uproar”. “We as a nation shouldn’t get discouraged. In every movement, up and down, are inevitable. The only way to sustain is to remain steadfast,” and with that, he rises up to greet another group of visitors with a smile, a handshake and a hug.